Adam is calling Spike Lee’s Blackkklansman the movie of 2018. Find out why below. 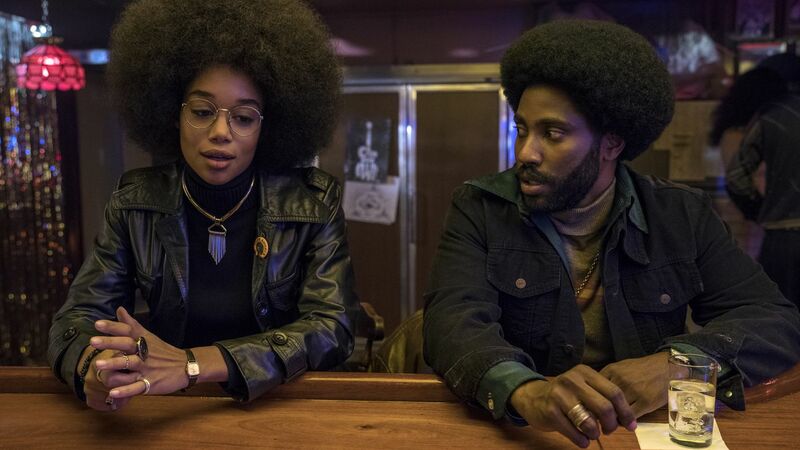 Spike Lee’s newest joint Blackkklansman is a searing return to form. The based on a true story film of how the first Black Police Officer in Colorado Springs was able to infiltrate the Ku Klux Klan is Lee, Cast, and Crew working at the top of their respective crafts. The result is a film as funny, angry, intelligent, relevant, and entertaining as you will this year. The film based on the Autobiography by Ron Stallworth of the same name details the sometimes outrageous gambit pulled off by Stallworth (played by John David Washington) and fellow officers Flip Zimmerman (Adam Driver) and Jimmy Creek (Michael Buscemi). Blackkklansman is unapologetically a police procedural thriller that harkens back to the films of Sydney Lumet. Though there are moments of humor and levity, showing just how stupid these Klansmen are, Lee never creates a cartoon image. These are dangerous men and women and Lee never lets the audience forget it. Part of the success of the film comes from Lee’s ability to show both sides of the law without compromise. The film paints a realistic portrait of 1970’s Colorado Springs in all its ugly and beautiful grandeur. Lee does this by showing Stallworth’s day to day life as a cop. The apathy, the casual racism is never set pieces but rather fully formed story moments, story arcs, visual flourish, and editorial flourishes embedded into the story. This is shown from Stallworth’s point of view, a man who wants to make the world a better place. It is through his example and his bravado that officers like Zimmerman and Creek wake from their apathetic slumber to see they are facing real evil in their hometown. The cast as a whole is on par with a (casting) miracle. Everyone is perfectly casted in their role. Every role perfectly performed by a cast not only game to tell this tonally trick story but rises above and beyond that challenge. This cast is as good as Lee has ever assembled in one film. Credit to Casting Director Kim Coleman who put the movie’s role together with the right sort of artistic alchemy that leads to retrospectives on how amazing a cast a film put together decades earlier. Ron Stallworth is as complicated contradictions in terms Police Office has ever been put on screen. John David Washington plays him with the charm, swagger, intelligence of a Star twice his age. The young actor with this performance rises above the rank and file actors to Star status. At turns, Washington is asked to not only for that Star performance but shift to the sort of subdue complex performance that was akin to Lee’s earlier work. Stallworth could have been a cipher for other characters to “sound off” on but Washington and his charisma refuses to allow anyone to come close to this. The work he does with both Adam Driver and Laura Harrier makes each better than they’ve been before in films. It’s that sort of gravitas that makes a Star and Washington has it and then some. The biggest find, other than Washington, is Laura Harrier as Patrice Dumas. Dumas is the fierce political activist who is part guiding light (for Stallworth) and part true blue social justice warrior. In Harrier’s hands, she is not a weeping willow but a strong intelligent woman who knows what she does is “a fulltime job” with “no vacations”. The role is miles away, thankfully, from the dredges of Spider-Man: Homecoming. Harrier and Washington make an amazing onscreen couple, generating more heat through dialog and performance than most onscreen couples do through consummation. It’s a beautiful role as Harrier is allowed to be a real person and not an object of desire as many stories of similar ilk would do. Patrice and her courtship with Stallworth are based on his interest in her ideals and her mind. It makes for a wonderful role and performance for someone that isn’t just a story beat but has a life beyond when we see her on screen. Harrier is able to take it and run with it in a way that will only lead to bigger and better things for the soon-to-be in-demand actress. Though a performance piece Blackkklansman’s star is its director/co-adaptor, Spike Lee. Having directed over 80 films, documentary, television, music videos, and shorts the Film feels next level for the director. This is Lee at his most potent and powerful ala Do the Right Thing and Malcolm X. Both a humanist and a provocateur there isn’t a subject that Lee isn’t able to critique or lambast within the film he takes aim at. From Racism in all its forms, Police Brutality, Blaxploitation, Gone with the Wind, and Birth of a Nation there is nothing that Blackkklansman doesn’t take on with laser precision. One should see this film if only to truly understand why Birth of a Nation is a disgusting film, no matter the supposed “Art” behind it. What is the most beautifully adroit aspect of Lee’s direction is Blackkklansman never once stops its propulsive narrative for these critiques and condemnations. Lee manages to find a way to articulate these sentiments organically as a part of the narrative whole rather than a piece of it. Blackkklansman is what we as an audience search for but rarely finds; an entertaining and enlightening piece of bravado cinema. Bravado Cinema told by a Master Filmmaker at the height of his powers and prowess as a storyteller. Blackkklansman is the movie of 2018.